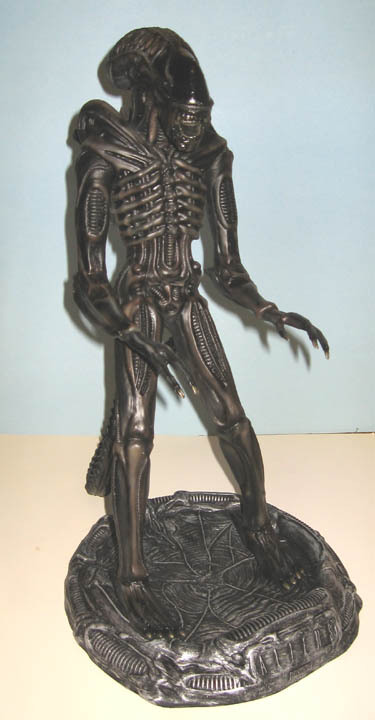 For more information on unproduced collectibles, check out Marc Cawiezel's The History of Unproduced ALIEN and PREDATOR Toys! 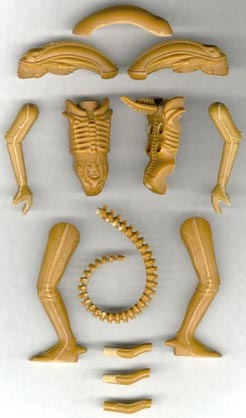 Perhaps due to the fiasco (or fury) over the original 18" Alien Warrior, Kenner decided not to not proceed with production their planned 3 3/4" Alien action figures (the same scale of their popular Star Wars action figures). 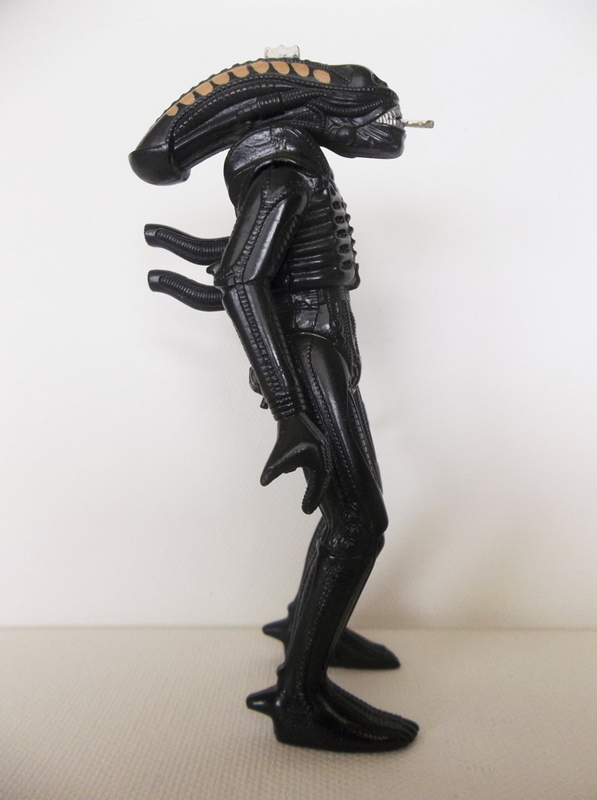 Five different prototypes were made: Ripley, Ash, Dallas, Ripley in Spacesuit, and what would surely have been one of the most desireable action figures ever made, the original Alien Warrior. 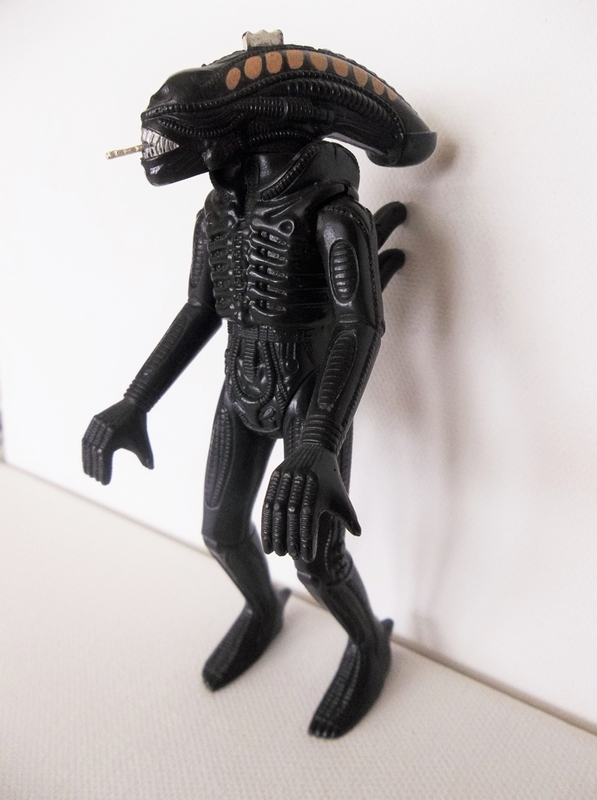 "I wouldn't exactly call myself an expert on them, but over the last couple of months I've heard about them and made it my crusade to find photos or something about them. 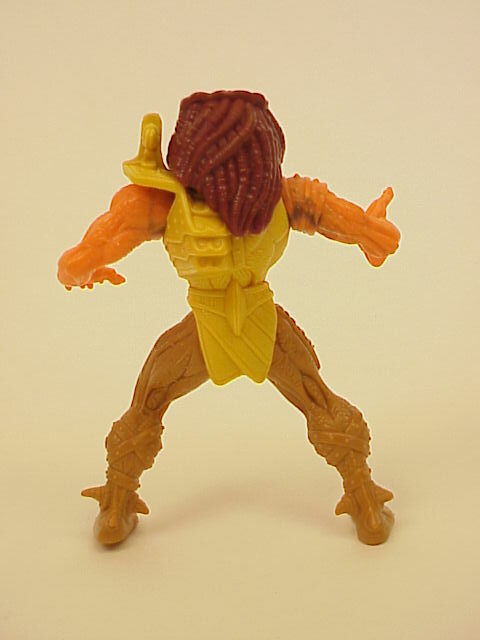 Here's what I've found out. 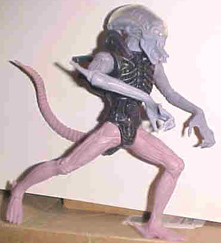 In 1979, Kenner thought that if any sci-fi flick had the power to overtake Star Wars, it was Alien, so they retrieved the rights to the figures. 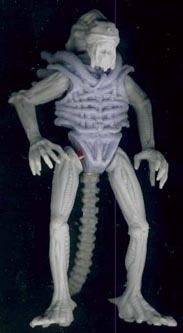 After the 18" Alien was boycotted and banned from the shelves, Kenner declined to produce the figures. 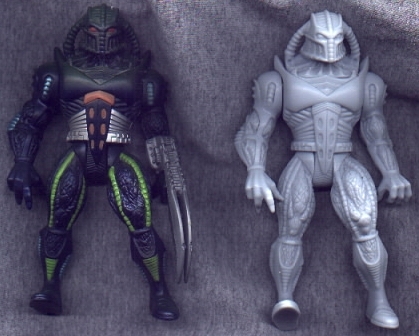 I originally heard in Toy Collector magazine about these in an article about lines that never made it. 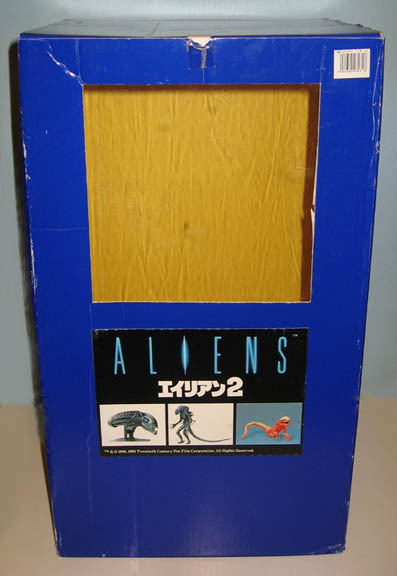 They only listed Ash, Ripley, Dallas, and an Alien figure as planned for the line. 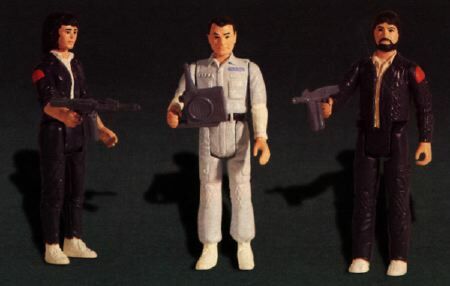 There is this one guy who is a 80's toy nut, who I've talked to a lot over this period of time and he told me that the Dallas' body appears to be a repaint of the Leia Bespin's body and that Ripley is somewhat a re-hash of the Bespin Security Guard. 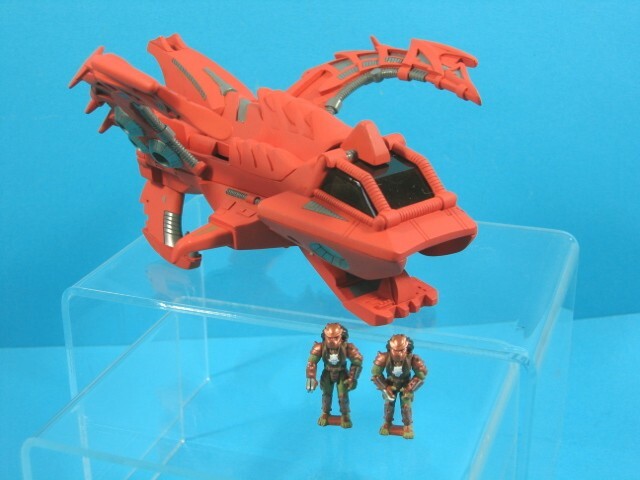 I've heard that the complete line was listed and some pictures were shown in Tomart awhile back, but I can't personally confirm this. 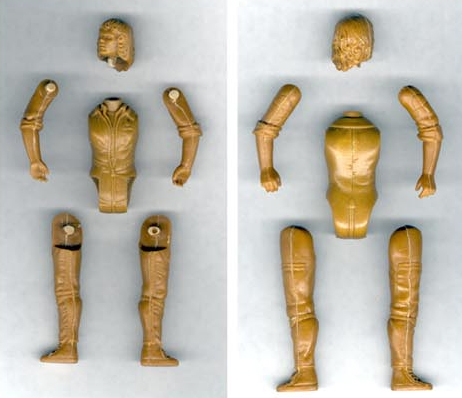 I was content with believing only 4 figures were planned, until a couple of days ago when I was surfing and found a page that specialized in female action figures. 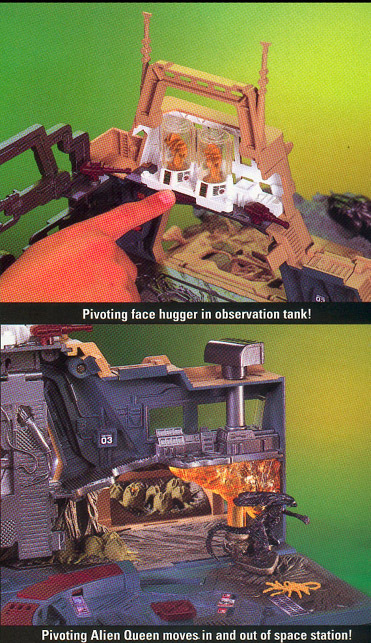 In their never made it archives, there were two Ripleys listed from the failed line. 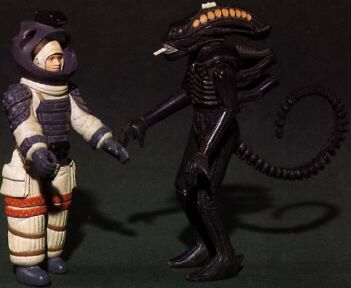 One was in the assumed flight officer uniform, and the other which was news to me was the Ripley in a spacesuit (end of movie, blows it out the airlock). 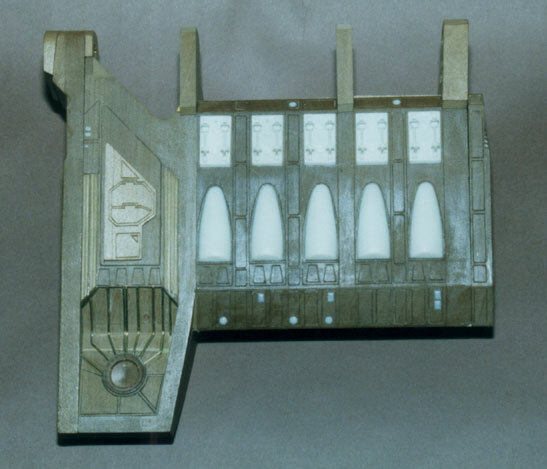 This led me to believe that maybe Parker, Lambert, Kane, or some of the others may have also been planned. 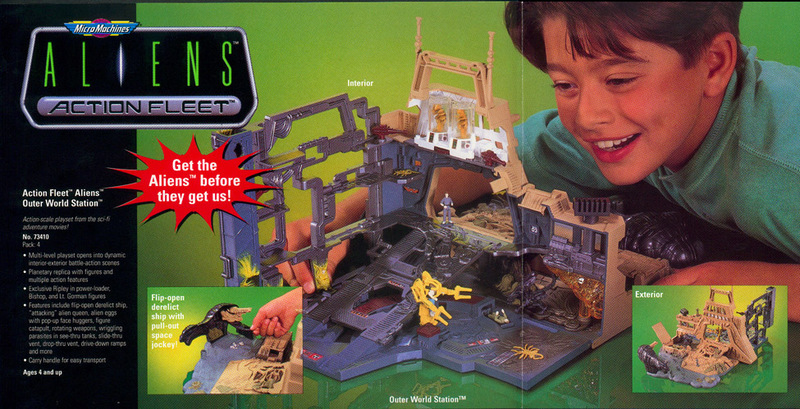 I've also had hopes of finding out about some massive Alien Ship playset that was planned, but no. 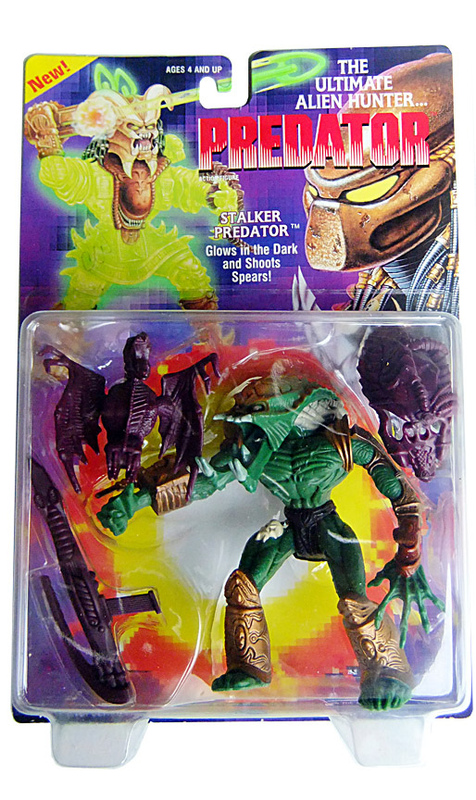 I will try to spread the word to you when I find out anything more." 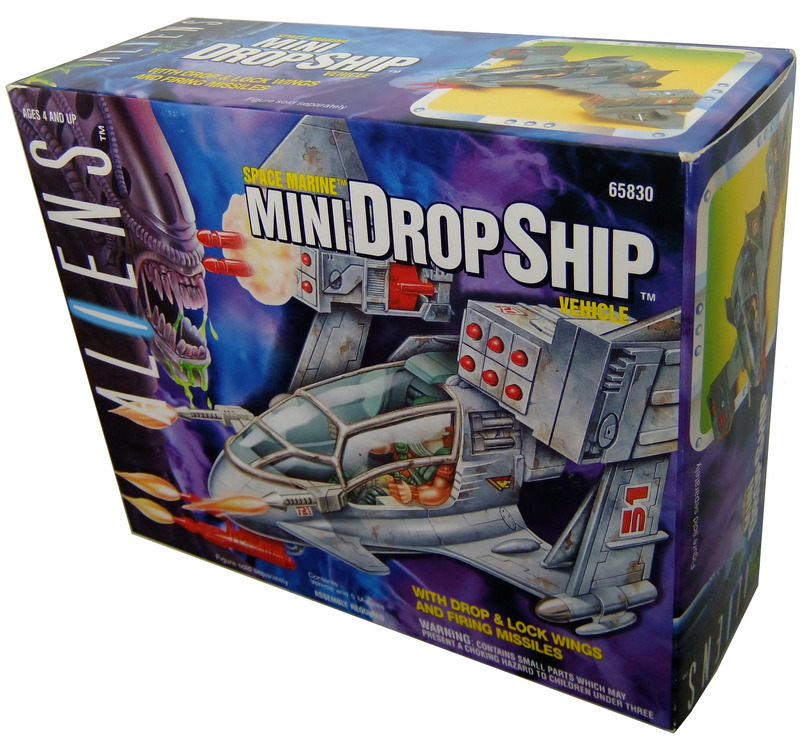 Our personal favorite all-time never produced item was the full size Dropship for the 1993 Aliens action figures (Kenner #65820). 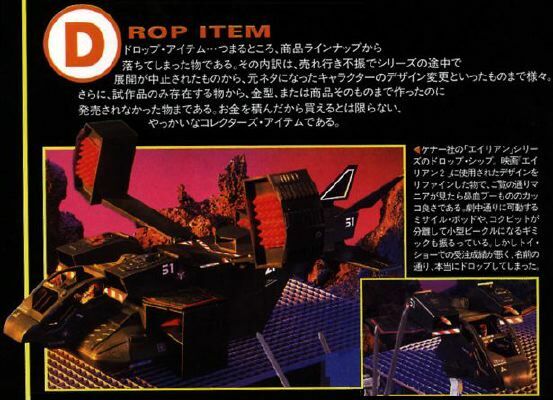 Loosely translated, the Japanese text reads: "Drop Item, which means the item was dropped from the product line (due to a sales depression and the changing character design). 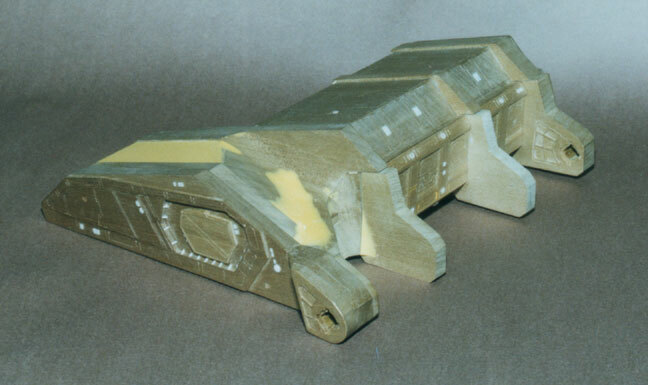 It only exists as a prototype and/or was made as a complete product, but later sold off. 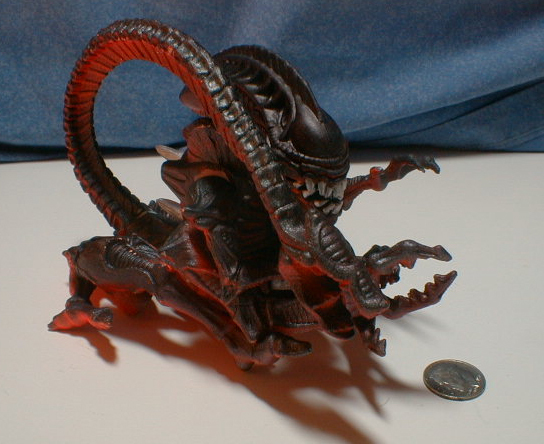 Impossible to get at any price. 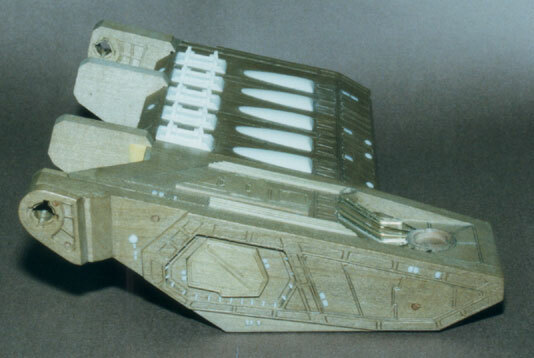 This is the Dropship from the film Aliens made by Kenner and refined from the design adopted in the movie. 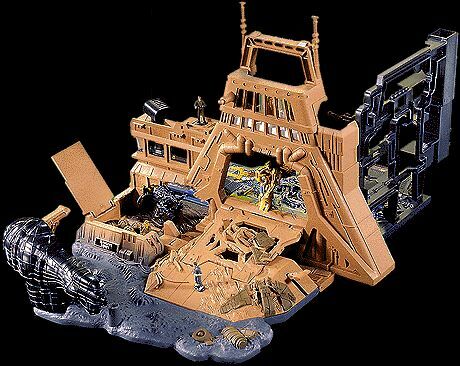 One amazing item, it has fine features such as a missile pod that works just as it did in the film. 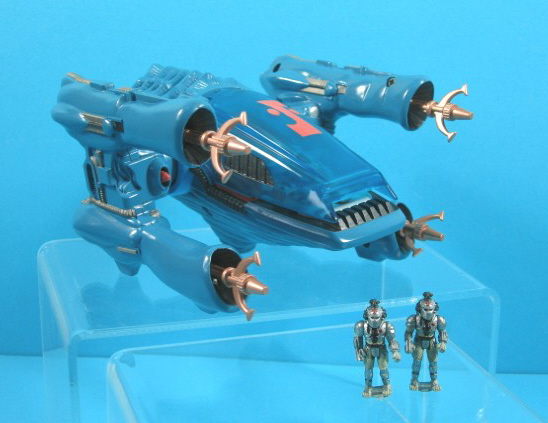 Unfortunately, as a result of poor orders following Toy Fair, just like the name, the ship was dropped (literally). 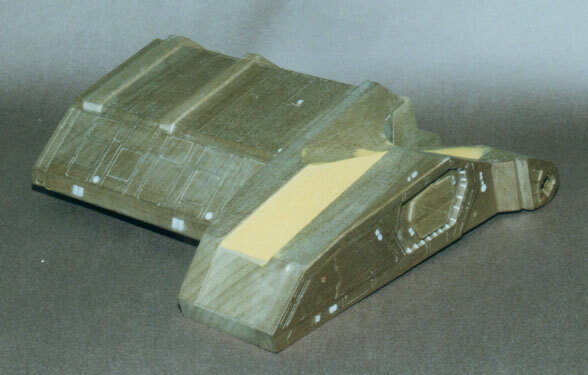 Kenner also planned a "Mini-Dropship"
And a full size APC (Kenner #65850) to hold the figures. 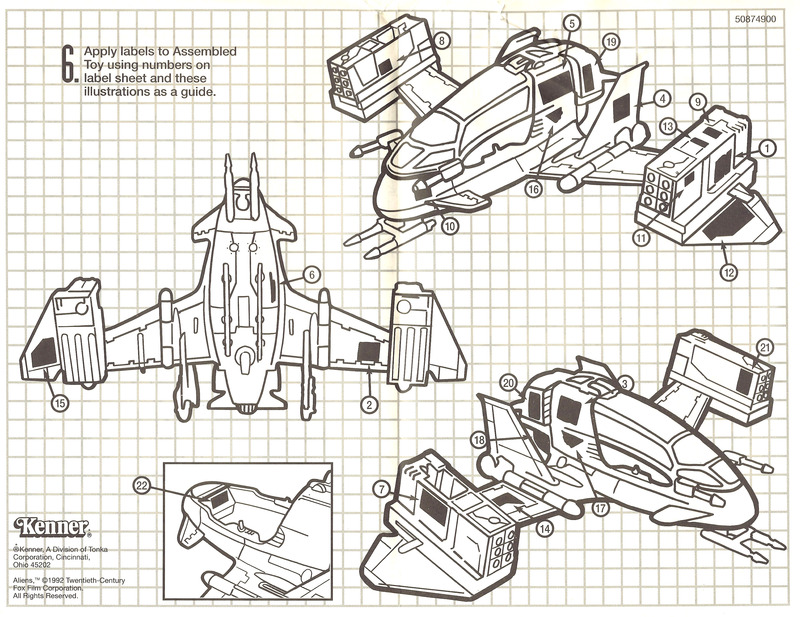 You can see this info listed and even a pic of the Mini-Dropship on page 230 of the Advance Comics catalog (February 1994) as well as the Previews catalog. 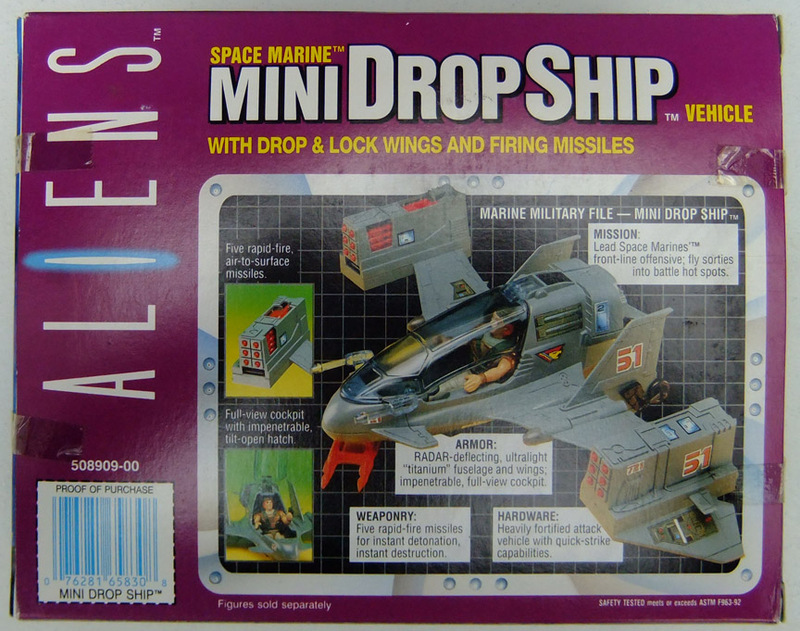 As some of you may already know, the "Mini-Dropship" was released with a different paint scheme and decals under Kenner's VR Troopers toy line. 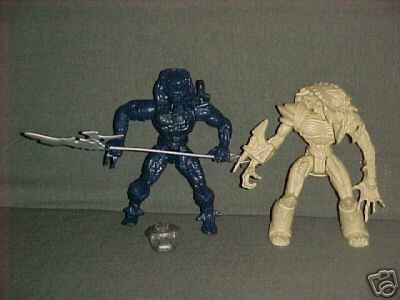 For those of you who wonder why the action figures of Hudson, Vasquez and O'Mally (this guy wasn't in the movie I saw, must've been the Special Special Edition) weren't released in the United States you may find this of interest: they WERE intended to be released but suffered the fate of poor sales. 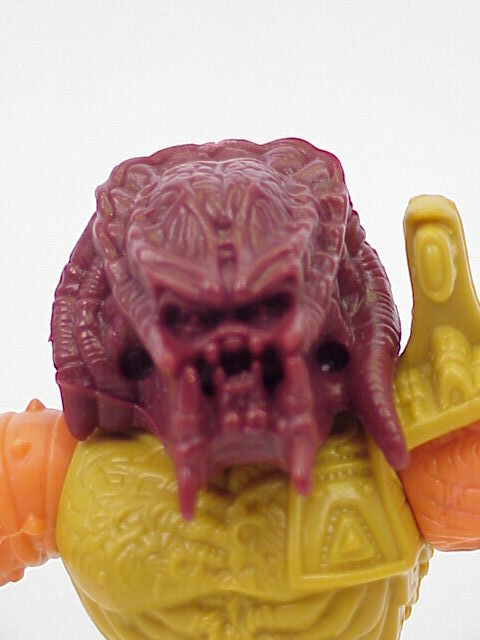 Of even greater interest was that there was a 2nd Assortment Wave of Space Marines that was to include the "Marines" from Predator: Dutch, Billy and Blaine (listed in the same Advance Comics issue, page 229 as Jungle Dutch, High-Tech Dutch, Blaine and Big Knife Billy). 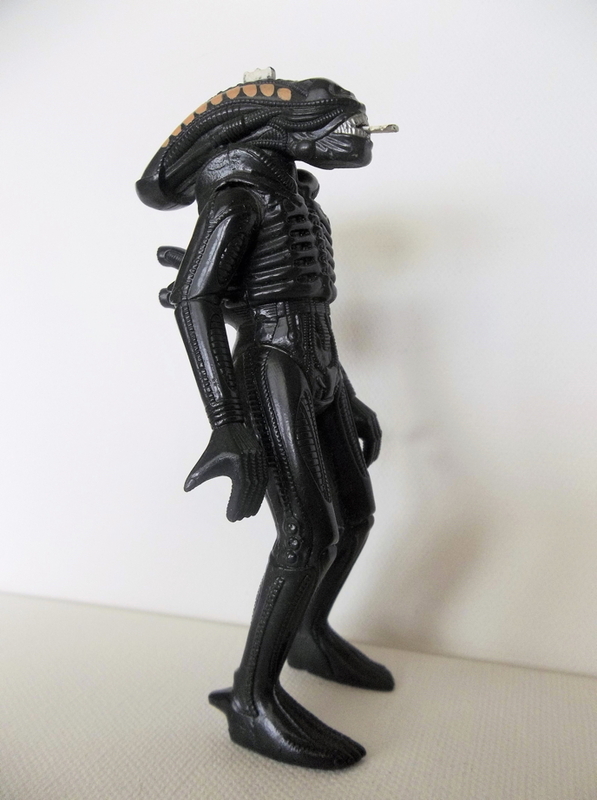 In 1994 Kenner was selling a direct mail order Darth Vader statue as part of their "CinemaCast" series of high-end collectible statues. 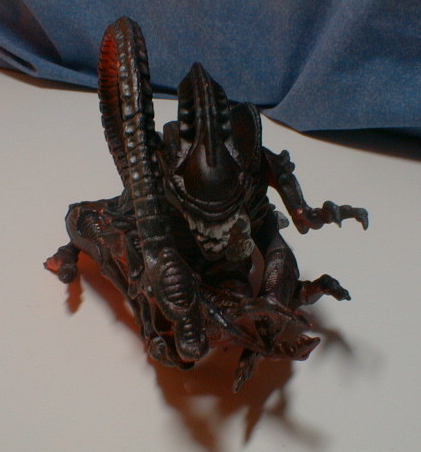 There was a copyright notice at the bottom for Aliens and Predator, and in fact, an Aliens Queen prototype was made, but unfortunately, never made it into production. 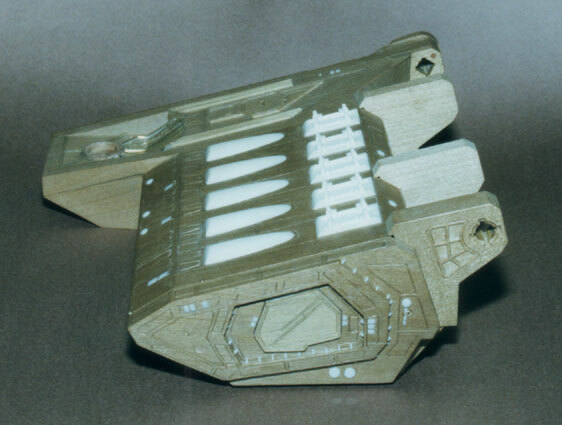 You can see pics over at The 8th Passenger. 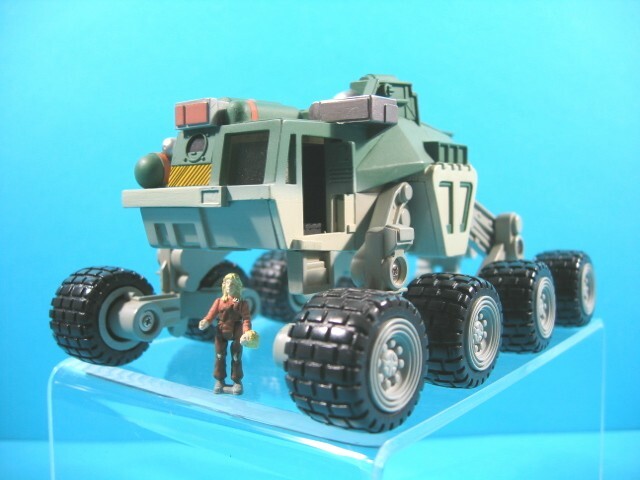 Amazingly enough, even though 10 years had passed since Aliens, Galoob actually had the genius to create Action Fleet Vehicles from Aliens. 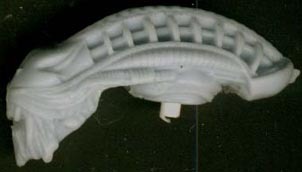 Cancelled due to lack of demand was the "Outer World Playstation," really a micro version of LV-426. 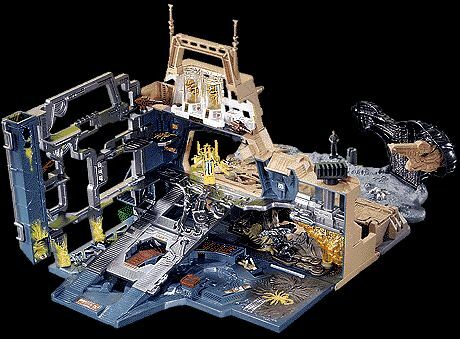 This was one of the most amazing playsets ever created, and included micro figures of Bishop, Gorman, Ripley (in Power Loader) and assorted Aliens. 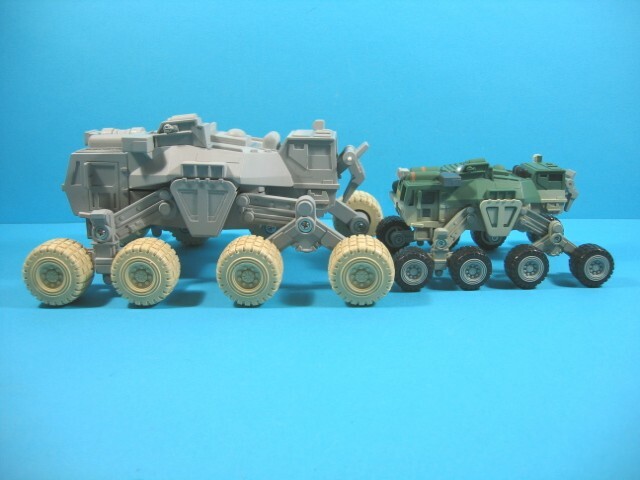 There was also talk of making a micro Jordan Tractor from the Special Edition (again, as listed in Previews) but those plans were cancelled as well. 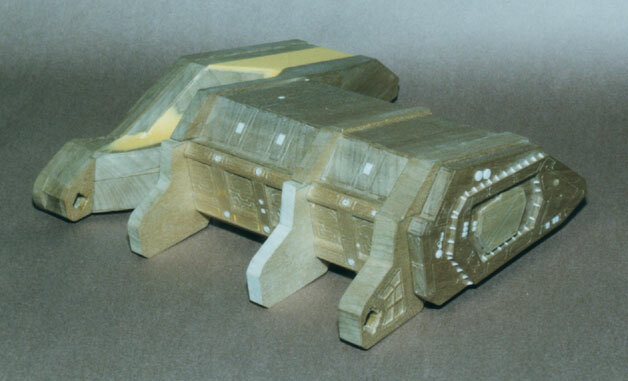 With a huge credit to Erik Shank, we're thrilled to bring you the first seen shots of what would've been an Aliens classic. 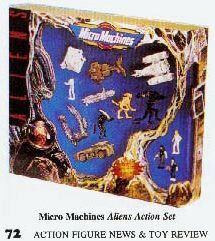 Finally, there were tentative plans to release all three micromachine sets in one large package (Galoob #74848) like the Star Wars & Star Trek collections (as seen on page 72 of Lee's Action Figure News & Toy Review and also in the Advance Comics catalog). 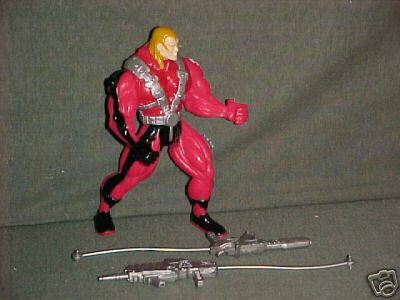 In 1989 Matchbox Toys had released a large scale action figure called "Maxx FX." 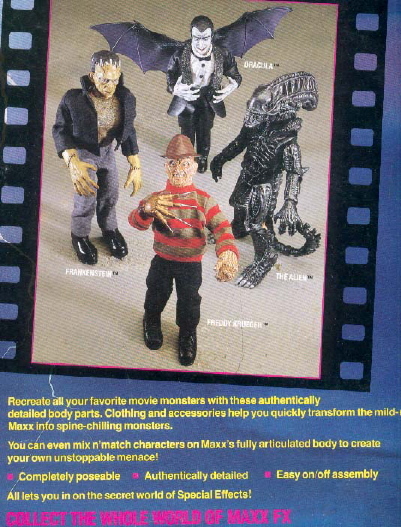 The toy was shipped with a Freddy Krueger costume and planned future versions were to include Dracula, Frankenstien and, yep, that's right, an ALIEN costume. 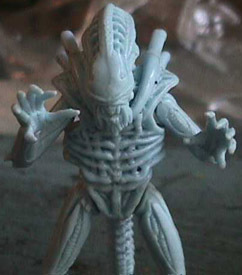 As in the case with the Kenner figure, parents protested and the line was cancelled (you know, my parents let me play with Aliens toys, and look how I turned out). 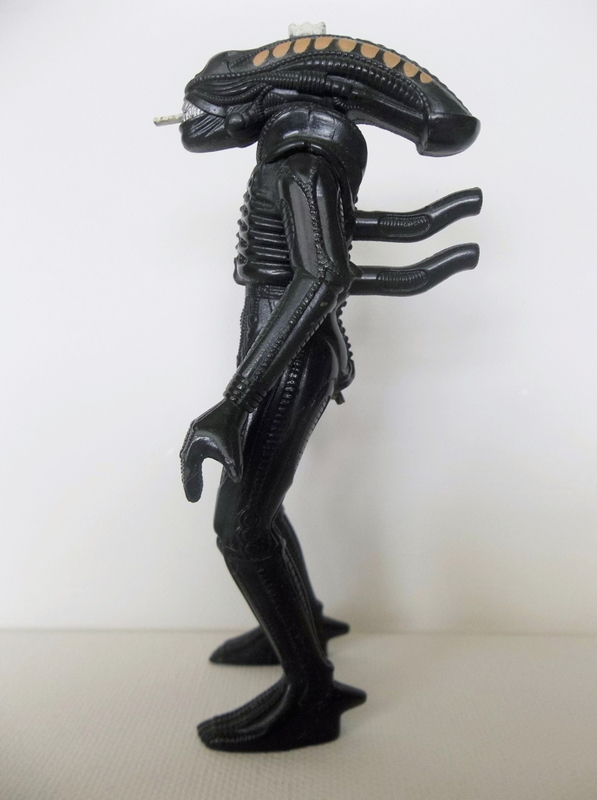 "I bought this a couple of months ago and I can't find outÊwhether or not this figure made it into production. 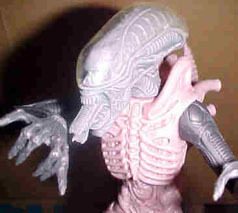 It is an Alien warrior from "Aliens" made by Ogawa Studios, Inc in 1998. 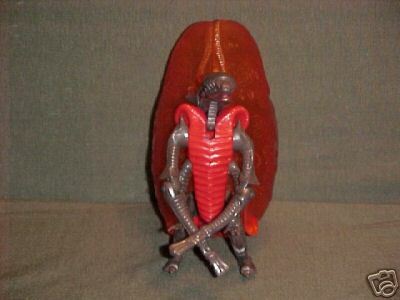 It has copyright dates on one of the back spines (TM 1986, 1998 by FOX) and copyright dates on the base (TM & c 1986, 1998 Twentieth Century Fox Film Corporation All rights reserved. 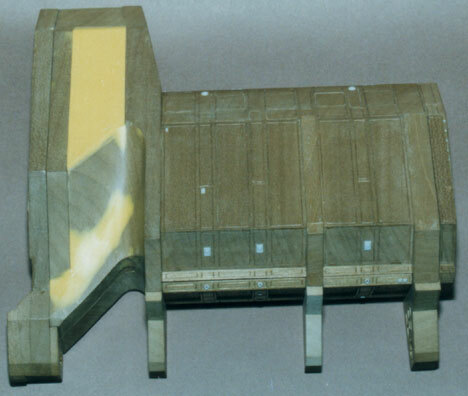 Ogawa Studios latex model). 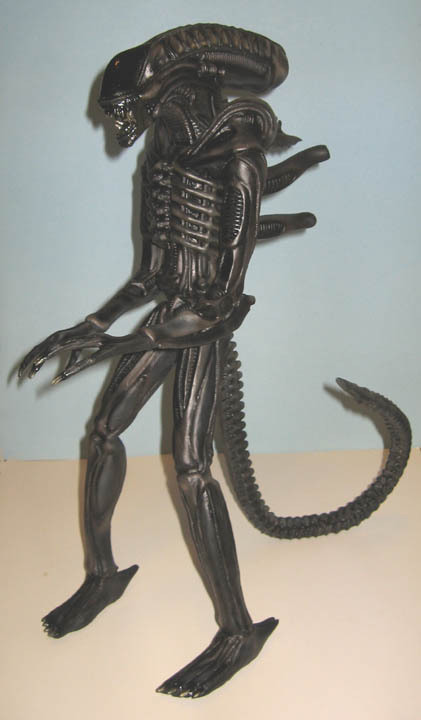 The figure is 20" tall and Êmade of latex over foam with a wire skeleton underneath. 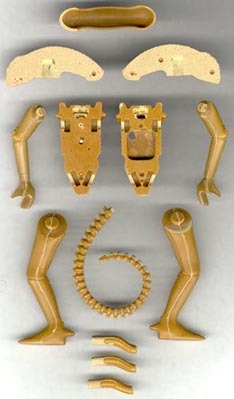 The arms and legs are bendable at knees and elbows. 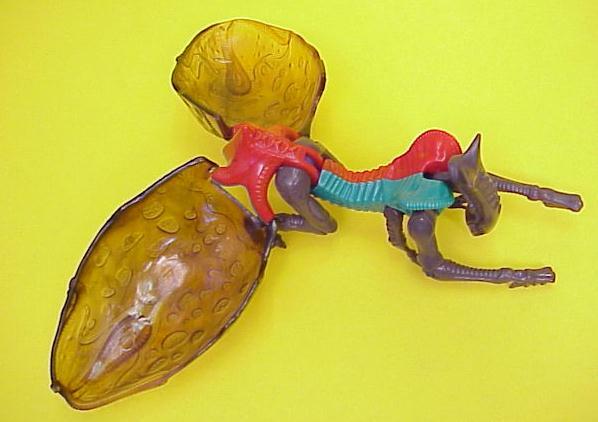 Tail is also flexible. 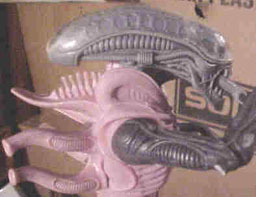 The base is a completely seperate piece and is made of heavy rubber. 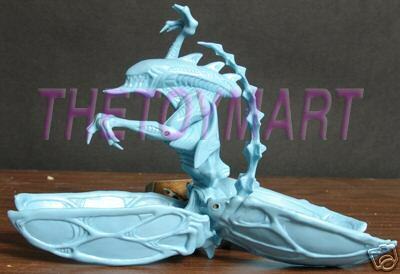 I have the sample box also. 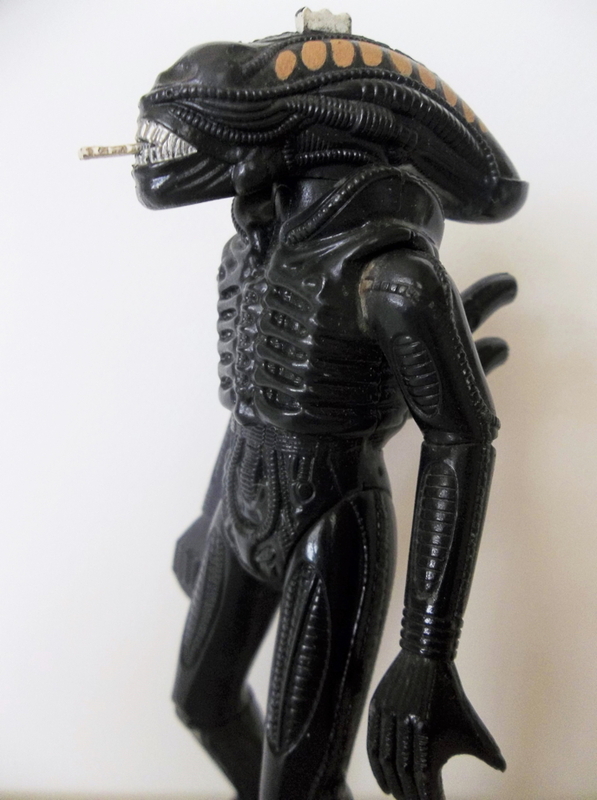 Starpics planned to include Alien 3 tatoos with random packs of it's trading cards but gave up on the idea. 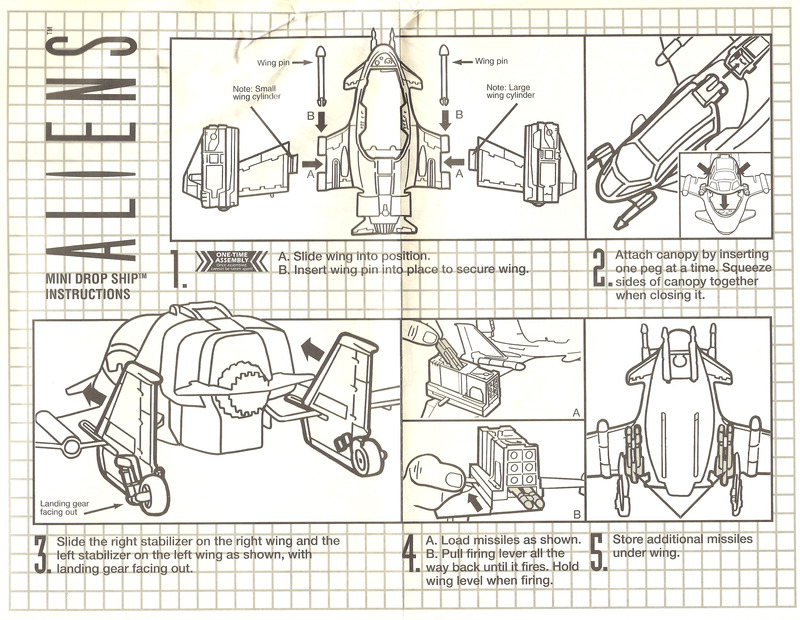 There were plans to make an Alien 3 full size door poster (similar to the Aliens one) but it never materialized. 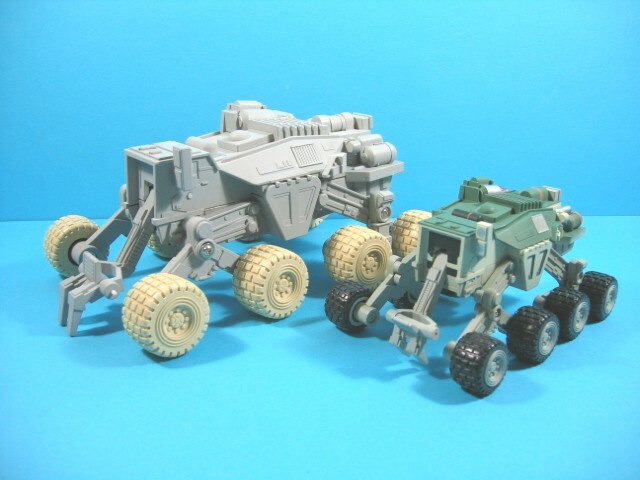 Galoob had a set of micromachines planned, but they were scrapped. 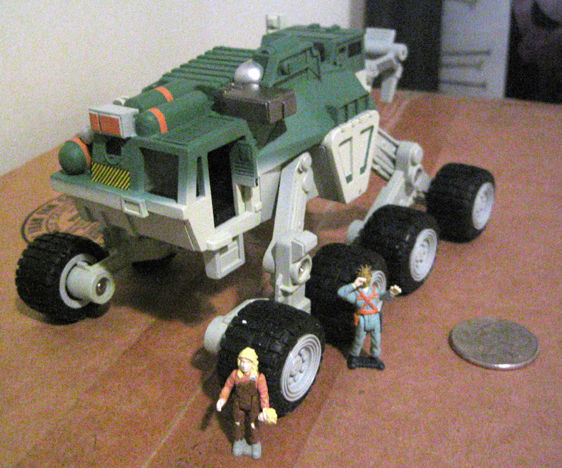 The assortment was to include the Auriga, Betty, Harvester (early script draft) and a few characters. 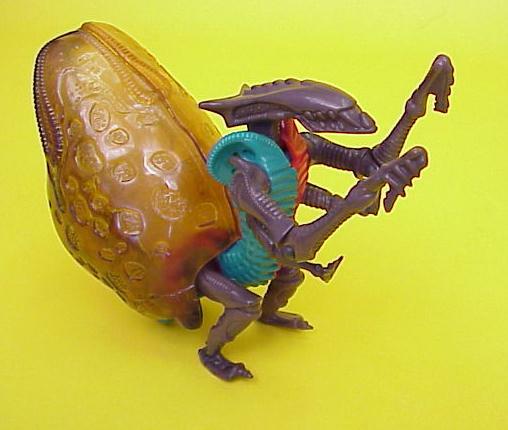 I only designed the figures. 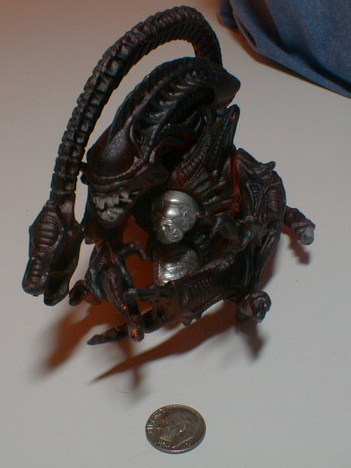 I did not do the actual sculpting. 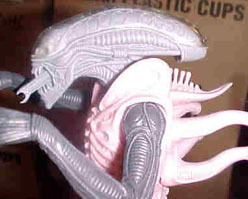 I am sorry if the info lead to any confusion about that. 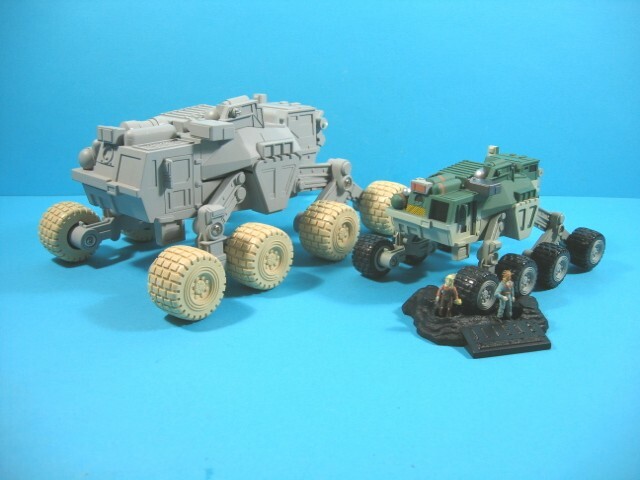 The other designs were for Colonial Marines, because the company wanted to continue the previuos toy interest in the Marines into this line of toys. 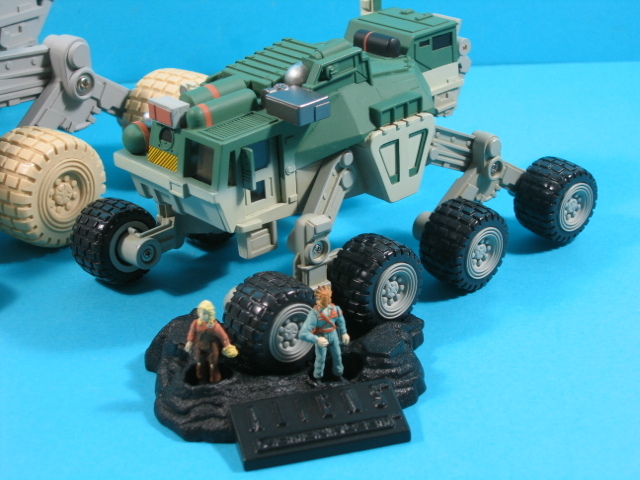 Even though, obviously, there were no Marines in the film! 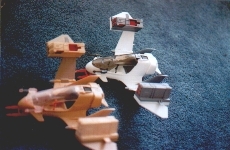 Silly but I did the designs anyway. 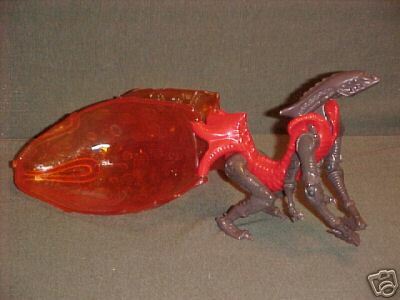 Hope that answers your question. thanks for the email! 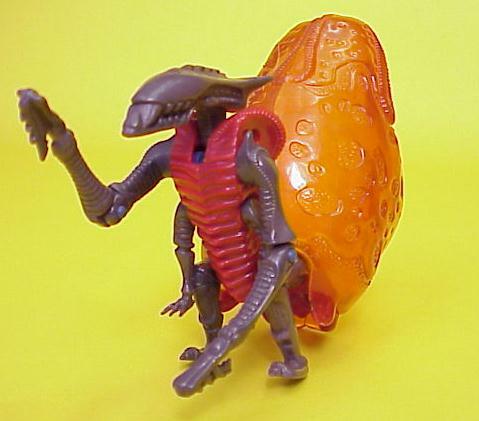 Finally, Harper scrubbed their plans for a 1998 Alien Resurrection calendar. 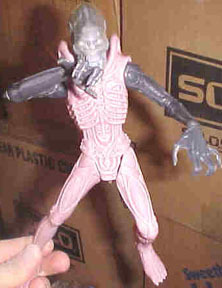 The above figure is an unproduced 20th Anniversary Alien Warrior 8 1/2" Action Figure Prototype that was to be a single follow up piece to Hasbro's Signature Series Alien Resurrection line (most likely in 1998 or 1999). 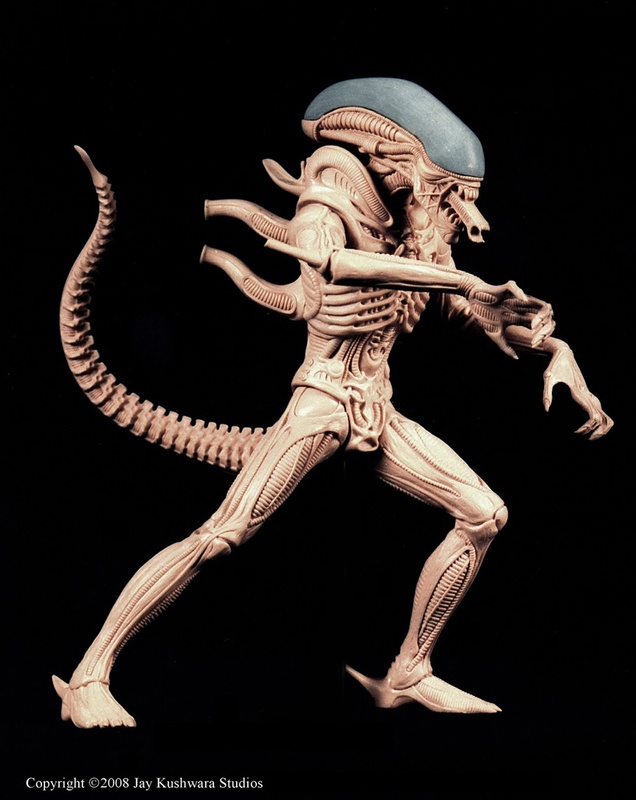 The design team was given free reign to design and sculpt the best Giger inspired Alien Warrior from the first film and used every bit of 2D & 3D reference material they could find to make it as accurate as possible. 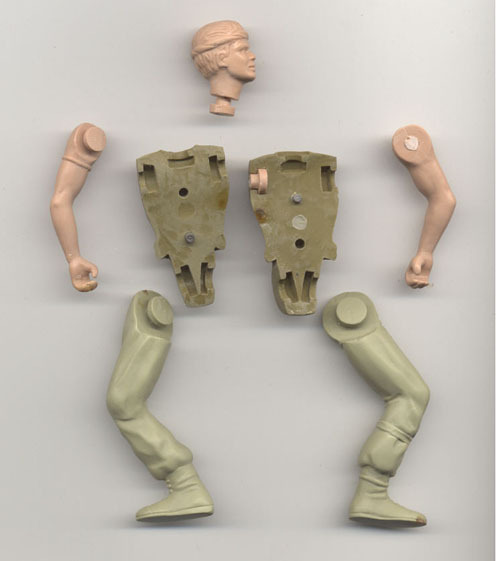 This prototype is cast in 3 different colored plastics and is articulated at the neck, shoulders & hips. 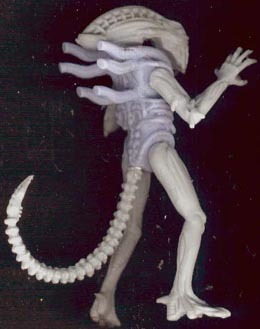 Head, back spikes, tail & left leg are removable and are held in place by plastic pegs. 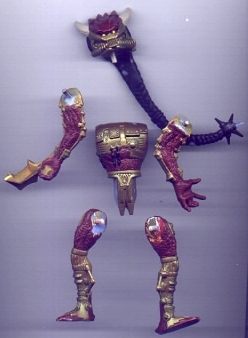 If you have any information on the above figure, please contact us. 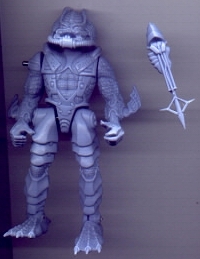 The above unproduced figure is supposed to be one of the first 4 figures scultped & proposed to Kenner in 1991 before they changed it to a slightly larger scale & more kid/comic oriented line. 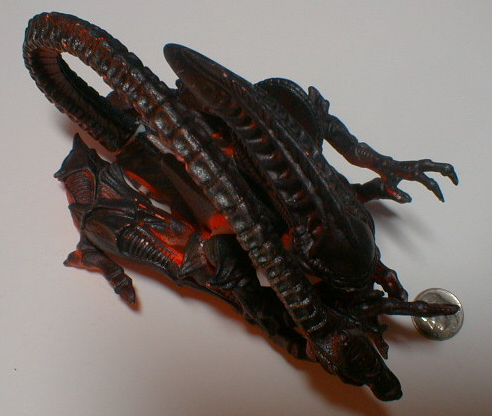 It comes apart into 7 pieces & is about 4" high. 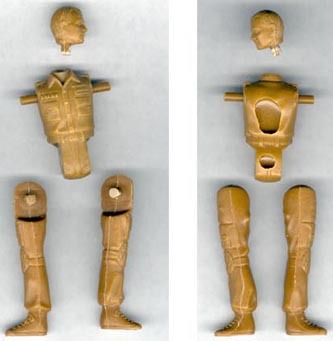 If you have any information on the above figure, please contact us.